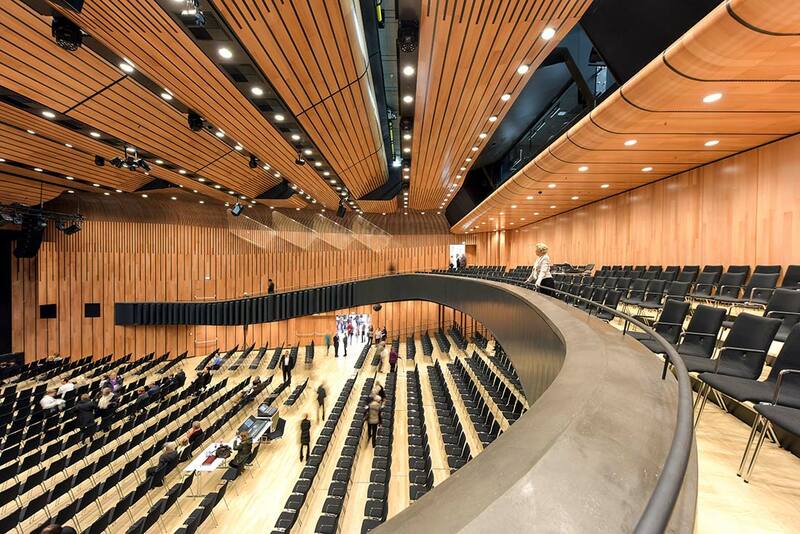 The Montforthaus Feldkirch, which opened in January 2015, is a new cultural landmark of the Vorarlberg Region in Austria and serves as a universal public center for the people in the region. 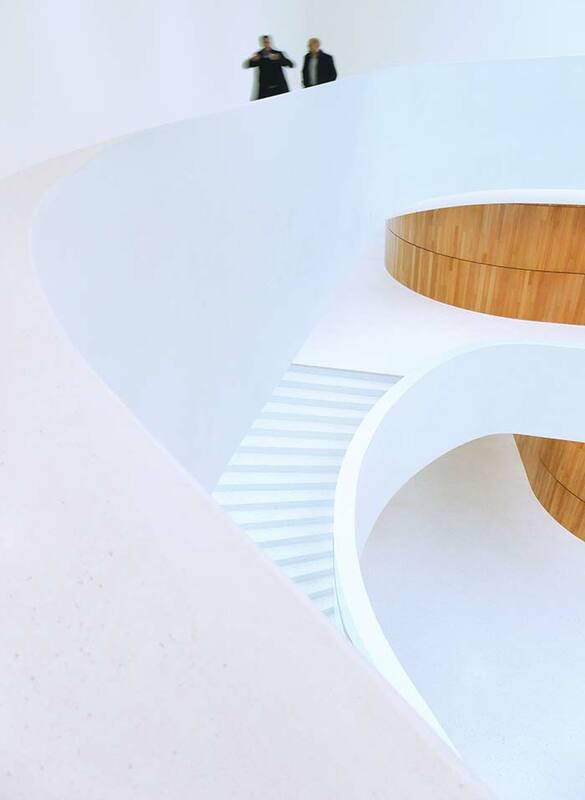 Located in the historical town center of Feldkirch, the organically curved architecture of the building detaches itself from the existing small-scale and heterogeneous urban-structure. 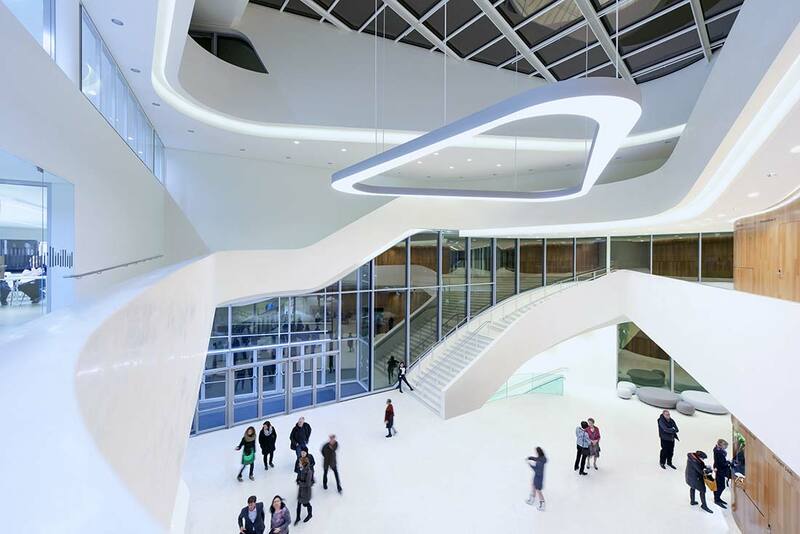 Like a rock in the river, the new cultural center lies embedded in the urban context of existing squares. 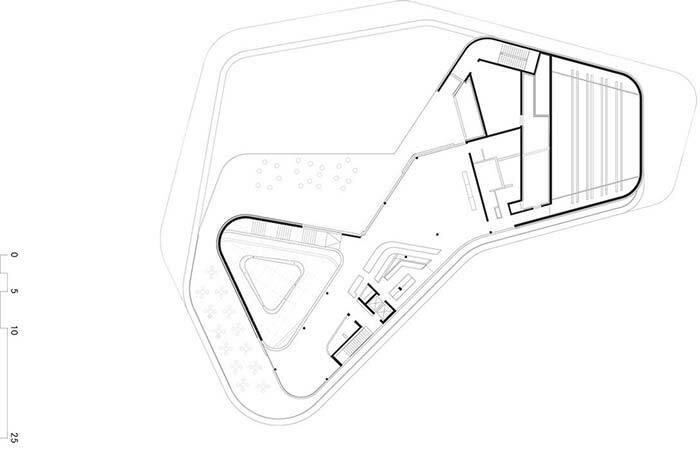 The building provides space for congresses, balls, exhibitions, concerts and stage performances. The restaurant located on top of the building allows the visitors to enjoy scenic views over Feldkirch. 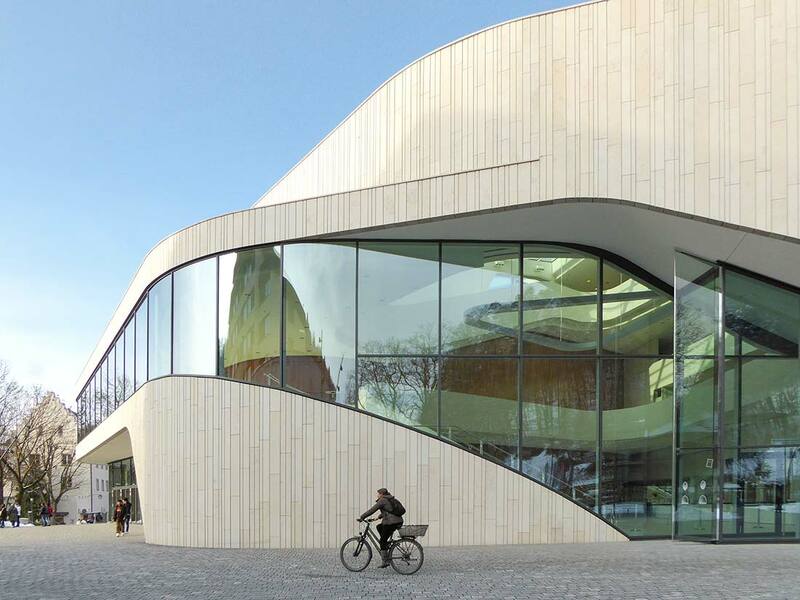 The guests will enter the natural stone cladded building from Rössle square. From there they are led into an open four-story foyer area with galleries. An extensive glass-skylight directs the view to the historic Schattenburg. 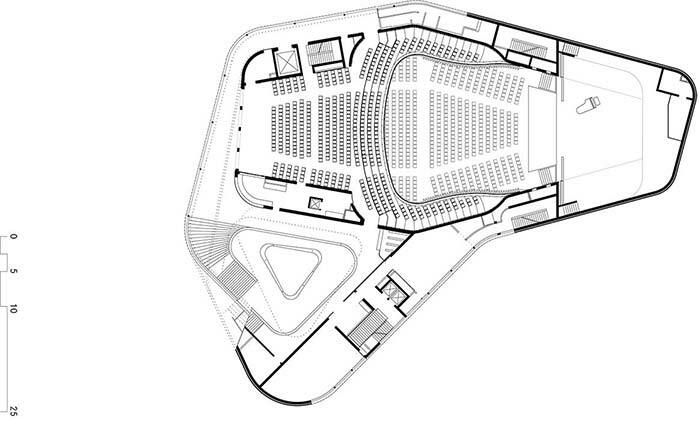 A curved staircase leads to the upper levels where the visitor can proceed towards the gallery of the concert hall, additional auditoriums and the roof-top restaurant and garden. 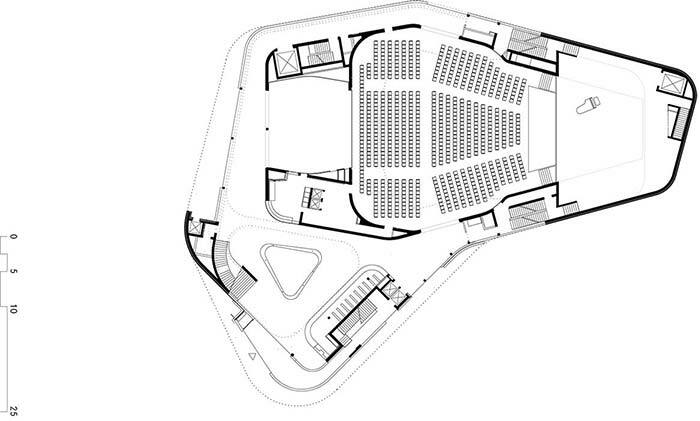 The concert hall accommodates up to 800 people, which can be linked to additional auditoriums located on different levels. Contrasting with the natural stone fassade of the outside, the concert hall and the auditoriums are cladded with wooden panels from both sides. With its excellent acoustics and equipped with the latest stage technology, the conert hall is one of the highlights of the building.